BoLASEPaKO.com - a simple view on Singapore Soccer: The de facto "ASEAN CLUB CHAMPIONSHIP"? The de facto "ASEAN CLUB CHAMPIONSHIP"? Prior to this afternoon's draw to decide this year's RHB Singapore Cup fixtures, there were all sorts of confirmed unofficial information (as those weren't issued by the FAS) circulating around, pertaining who were the foreign sides being invited and who decided not to come. As far as we are concern before the draw, the only confirmed official information was the decision by Courts Young Lions not to take part in this year's tournament due to conflicting schedules and fixtures, as mentioned on their website. Other than that, I gathered from social media platforms that defending champions Bangkok Glass (pictured below - last year after their win at JBS) would not return to defend their title because of their priority to concentrate on their domestic campaign. 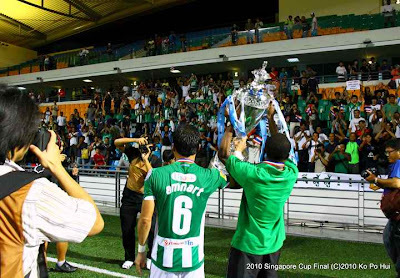 However, the main point of the entry is given the sizable foreign presence in local premier Cup tournament, is it still appropriate to call the "SINGAPORE CUP"? All the while, the organizers have maintain the essentiality of having such foreign element to lift the standard of the tournamen and expose the local sides to different style of play by playing against these invitees. With Bangkok Glass unprecedentedly being the first invited side to win the Cup last year, it somewhere might have change the way how we opined this tournament. It's not secret that all along the FAS are clamouring the setting up of ASEAN club championship (please feedback to me if I'm wrong), perhaps with the Singapore Cup continue in this direction, it could be just a matter of time the organizers might consider to upgrade this tournament to a regional tournament that would be beneficiary in fostering good relationship among our neighbouring countries using football? Seriously, FAS and S League should really stop their foreign teams nonsense. Does it makes any senses and pride for our DOMESTIC league and cup competition to consist of foreign teams? I really hope we can go back to the old days in which there are only local teams in the S League and Singapore Cup.